In case you don’t know Bobbi, she was working in America before moving to Asia in 2008 with her husband and her 2 hungry teenagers. (We wanted to see how her boys look like but her phone was too full with food photos haha!) She blogs about healthy international cuisine, specializing in recipes that are cardiac friendly, gluten-free, diabetic friendly or lactose free etc. I especially love her Asian dishes – her radish cake, shrimp and wild rice stem stir fry and my current favourites! Today, Bobbi is here to share with us a local Singapore delight – I have always wanted to try making this from scratch but she beats me to it! Read on to find out what she has for us and don’t forget to follow her on her blog, Facebook, Twitter, Pinterest, Google+ and Instagram! 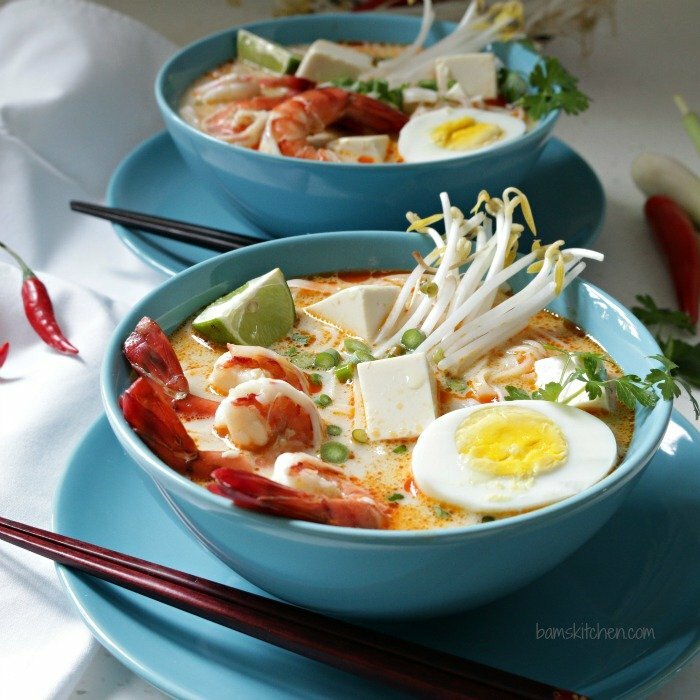 The rich laksa broth is made from a delicious mix of dried shrimp, chillies, shallots, garlic, coriander, curry is mixed in a rich coconut broth and filled with rice noodles, shrimp and topped with hard-boiled eggs, coriander and bean sprouts and drizzled with a little fresh lime juice. Hello to all The Foodie Baker readers! I am Bobbi (BAM) from Bam’s Kitchen and I am delighted to be guest hosting today on The Foodie Baker today. I have known Jasline for about three years now and have always loved her recipes and travel stories on her blog and always hoped that one day I could experience Singapore too. I always say that the world is a very small place as just this last weekend I was able to visit with Jasline in Singapore and even had a whirlwind tour with her as the tour guide. She greeted me with a big warm smile and a hug and it seemed like a dream come true to finally be able to meet in person. When she asked me if I would like to guest post on her blog, I was very honoured. 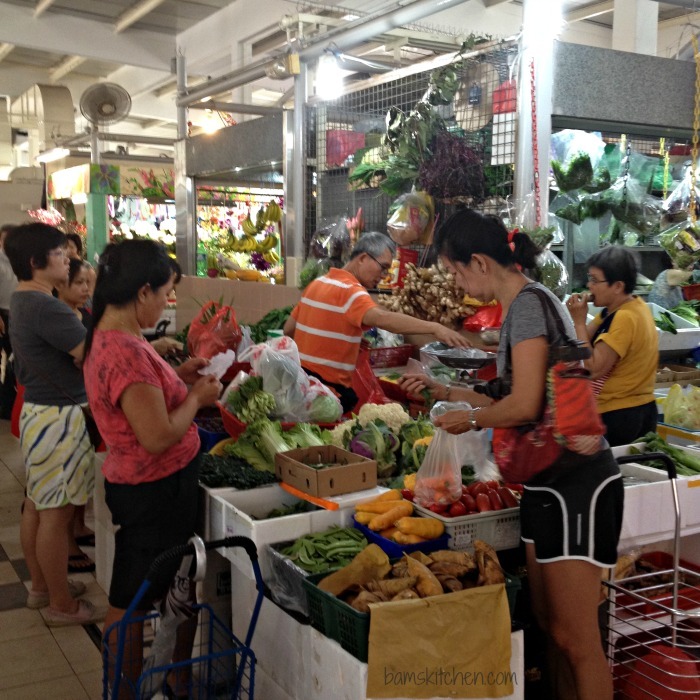 During my very short visit in Singapore, I was surrounded with food and shopping. Any of my good friends know, that I am not much a shopper so my visit was all around visiting friends and of course, “the food”. 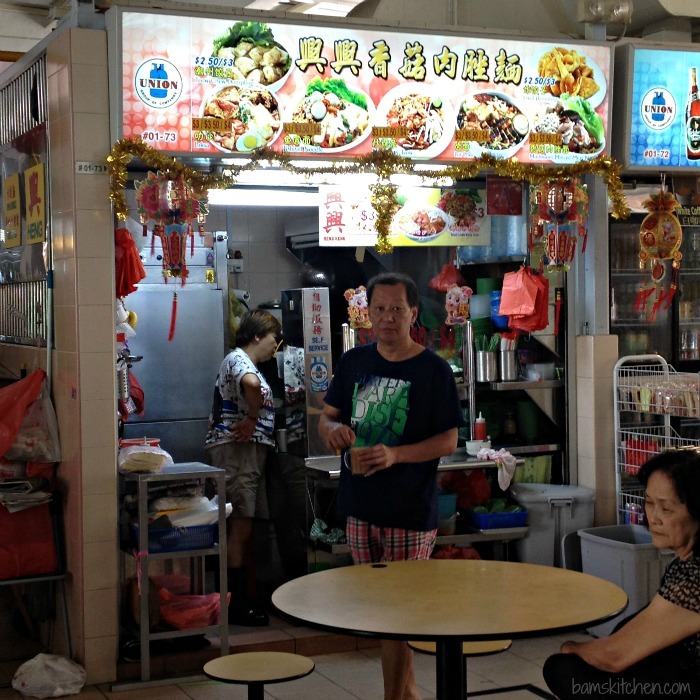 Singapore is clean, friendly and has great hawker stands almost everywhere you look. Hawker stands are scored with A through D grade to notify the public of their grades they received for cleanliness and hygiene in their cooked food stalls. The food stalls are required to display their scores in the window. There were so many to choose from but as I say when you are in Rome…or Singapore… I needed to try the Coconut Curry Laksa. You can just smell that amazing aroma and you know you have to try it. Sublime is the only word I can use to describe this delicious Coconut Curry Laksa also known as “Curry Mee”. I just love the rich coconut broth and the delicious noodles. I was praying that I would never be able to find the end of my bowl as it really is a bowl of comfort. I was trying to think of a recipe that Jasline did not have on her website and noted that she did not have laksa in her recipe collection. 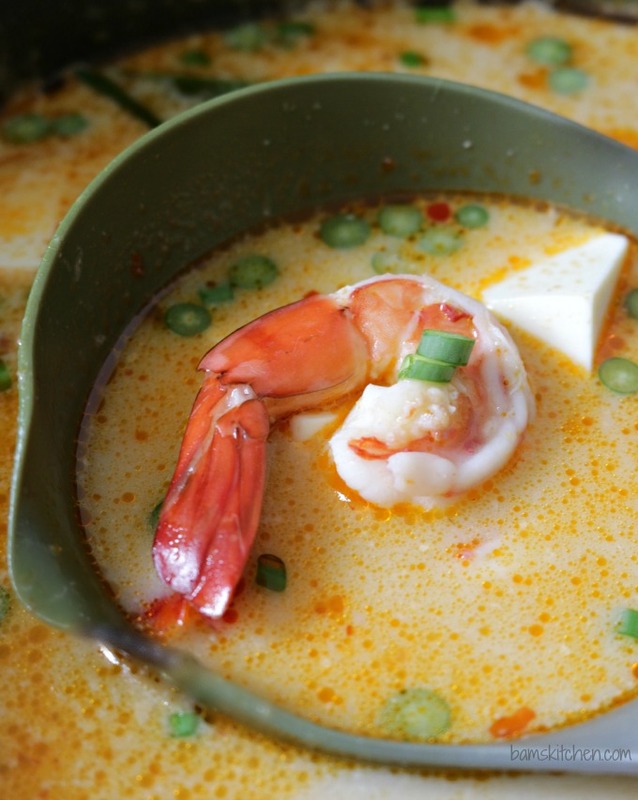 Did you know that Coconut Curry Laksa was noted as one of the top dishes in to eat in Singapore? Much like Thai dishes, coconut curry laksa has the balance of spicy from the chillies, sweet from the palm sugar, sour from the lime and salty from the dried shrimp to tantalize your senses. 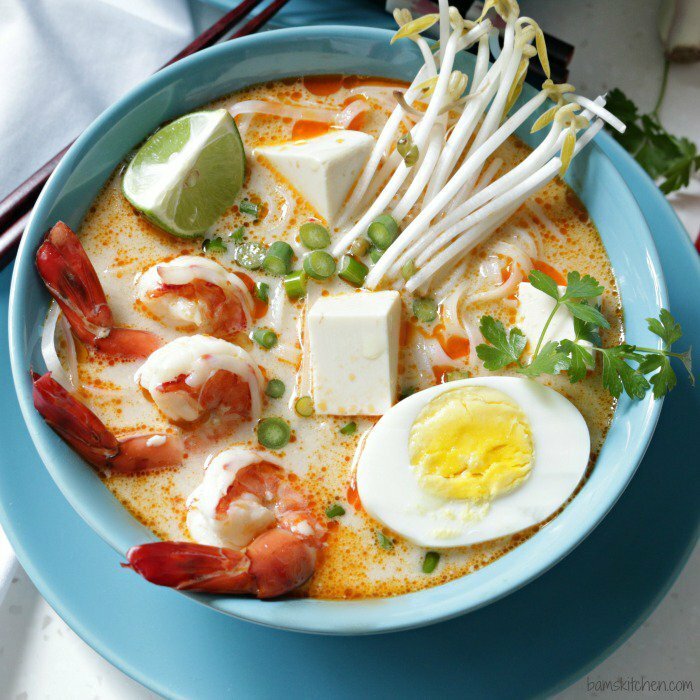 There are essentially 3 different types of laksa in Singapore such as curry laksa, asam laksa and Sarawak laksa. However, I like coconut curry laksa the most as it has the flavor combinations from both the Chinese and Malay together. This recipe is a little different from one vendor to another. I also have my spin on this dish as I wanted to make this dish gluten-free too. I wanted to remove the obstacle of the gluten-free factor so I made my own rempah paste from scratch. I used a mortar and pestle to blend the ingredients but you could also use a food processor. I added shallots, loads of garlic, bird chillies, dried chillies, dried shrimp that I had soaked and drained, macadamia nuts (as I could not find candlenuts at the market) curry powder (or can use fresh curry leaves) and fresh coriander roots (or can use coriander powder) , brown sugar (as I could not find palm sugar at the market today) and salt to help with the mixing process. I skipped the shrimp paste as I could not be certain, it was gluten-free. However, shrimp paste does add a deep earthy flavour to the paste. The beauty of making your own laksa paste is that you can adjust the heat, salty and the sweet in the dish to your liking. I love spicy food but sometimes it does not like me so I made my laksa very mild. You can skip this whole step and save time, if you find a Malaysian laksa (rempah) paste pre-made at the market. I also used a fresh Tom Yum pack that is available in our local Park n Shops here in Hong Kong and it includes fresh lemon grass, chillies, galangal, kaffir lime leaves, fresh limes and shallots. However, I know that these items will be very difficult to come by if you are not in Asia. I just love the aroma from the lemon grass and kaffir lime leaves but it you cannot get it where you live just omit this from the recipe. As bare minimum, you need to have the following items and these are rempah paste, coconut milk, brown sugar, limes, rice noodles, shrimp and some fresh toppings like cilantro and bean sprouts. Laksa is also made with different starter broths and we will never be able to get the secret to the broth from the vendors as this is the secret to their success. You can use canned or boxed chicken broth, vegetarian broth or even fish broth as your starter broth and you can have this dish on your table in less than 30 minutes. 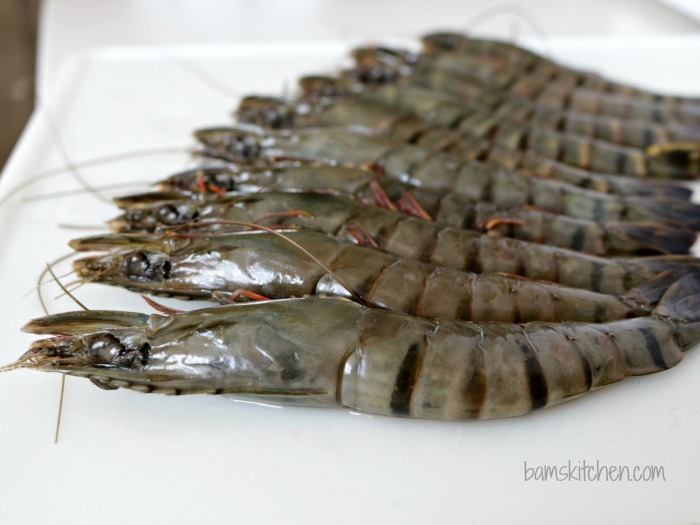 If you are a little more adventurous, you can make your own shrimp broth. I always buy my shrimp fresh from the wet market and they come with the heads on and all of their original equipment. I start my broth with a little canola oil in my pot and add some shallots and lemongrass. Then I add the shrimp heads and shells to the pot and then I simmer for about 10 minutes. I add water and bring to a boil and then to a simmer for about 40 minutes and skim along the way. I remove the shrimp heads, shells and lemongrass and season with a little salt to taste and you have a beautiful shrimp broth. In Singapore, they used these really thick and delicious laksa noodles. It is very difficult to find these laksa noodles elsewhere so I just exchanged with dried pad Thai gluten-free rice noodles or you could even use rice vermicelli. 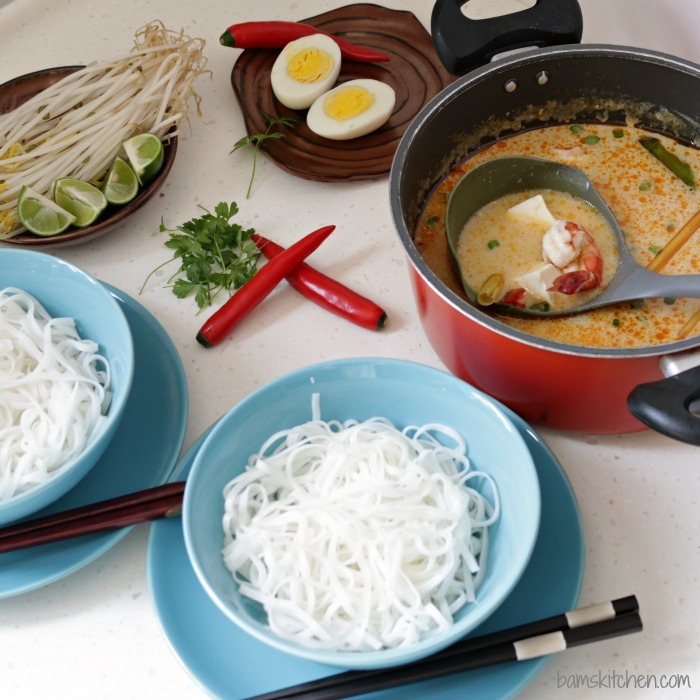 The trick of making this delicious laksa soup with noodles is not to over cook the noodles. I love when my noodles are a little aldente. I place my dried in a bowl and add boiling water and soak for about 5 minutes or just until softened but not all the way cooked and then drain them and set aside. Do not add them to the soups broth to cook or otherwise the noodles will soak up all the delicious broth. It is best not to cook the noodles all the way as when you pour the delicious hot steaming broth over the noodles it will cook them in your bowl while you are adding the garnishes. Now for the fun toppings… I love something crunchy on the top and bean sprouts (mung beans) are delicious. They traditionally serve deep-fried tofu squares but I wanted a healthier version so I just used firm plain tofu sliced into squares. Coriander (cilantro) leaves is a great substitute for the Vietnamese coriander called daun kesum. 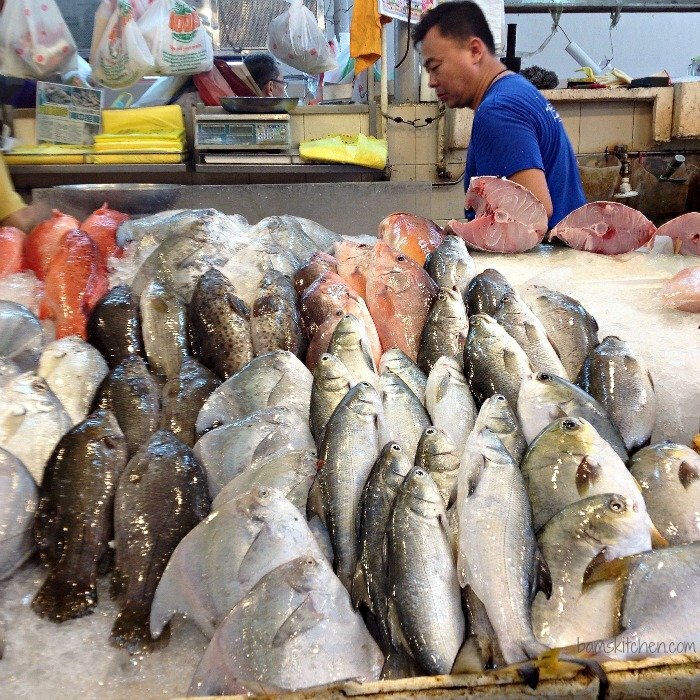 Slices of fish sticks, cockles and other goodies can be found at the hawker stations. Hard boiled eggs a big favourite as well as shrimp, limes and a side of chili sambal to taste. 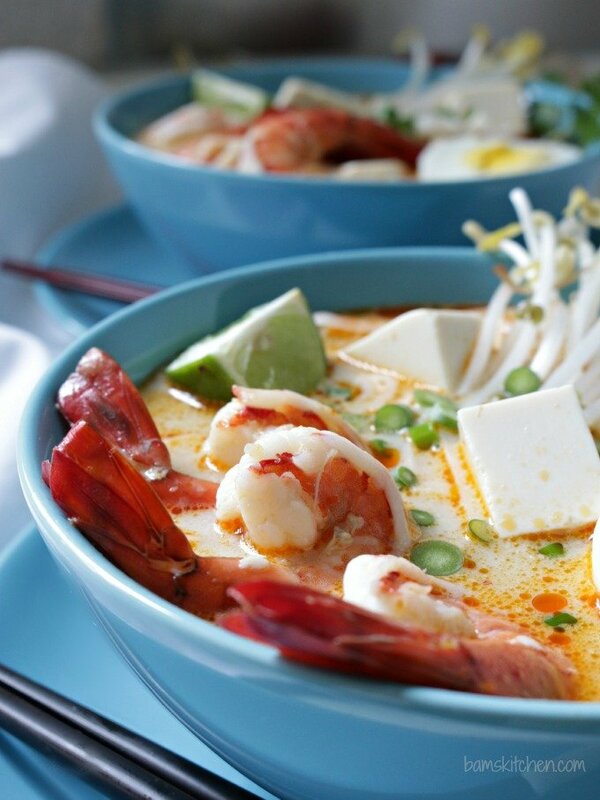 What are your favourite toppings for your laksa? Skip to step 2, if you have purchased pre-made rempah paste. If you are making your own rempah past, place your bird chillies, dried chillies, shallots, garlic, galangal, lemongrass, dried shrimp, curry powder, coriander, macadamia nuts, salt and brown sugar to you mortar and pestle or food processor and process until a smooth paste. If you need to get the food processor moving, add a little of canola oil. Soak your dried pad Thai noodles in hot water for about 5 minutes and then drain, rinse and set a side. You want your noodles to be aldente and not cooked all the way as they will continue to cook when you put a ladle of hot broth over the noodles during the serving process. Do not cook your noodles in the broth or they will soak up all of the lovely coconut broth. Place one tablespoon of oil into your soup pot and add 2 tablespoons of your prepared rempah past into soup pot and cook until you can smell the aromatics, 2 minutes. Add your chicken broth or broth of choice in the soup pot, coconut milk, lemon grass and kaffir lime leaves and bring to a boil and then reduce down to a simmer and cook for 15 minutes. Add the shrimp and cook for about 1-2 minutes or until they turn pink. Add the fresh tofu squares. Turn off the burner. Divide the softened rice pad Thai noodles amongst 2 bowls. Ladle several scoops of the delicious coconut broth over the rice noodles. Garnish with limes, hardboiled eggs, bean sprouts, fresh cilantro and chili sambal as desired. Enjoy! 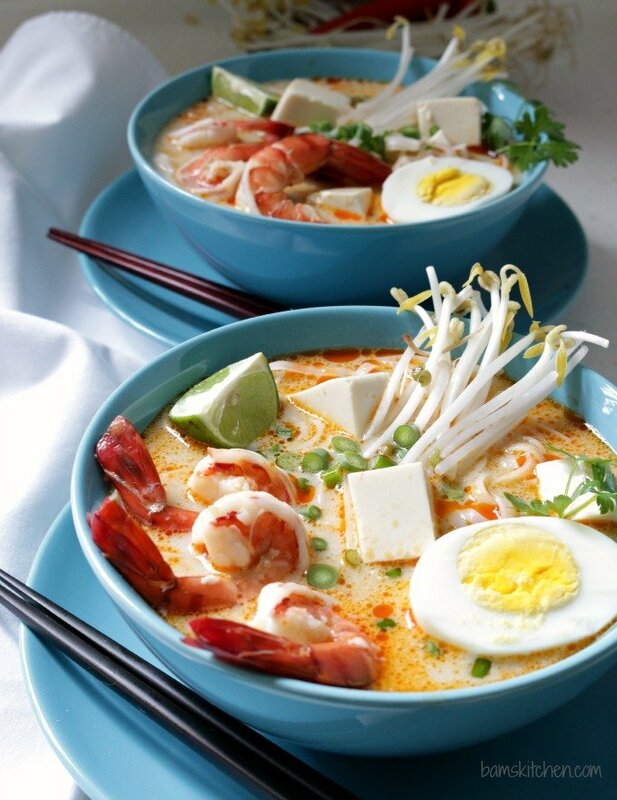 What a wonderful and mouth-watering laksa! It looks so good! And I love the spiciness it has. Very delicious! I have not heard from you for a while… I guess that you must be busy and nice to hear that you have a great CNY. Nice to know Bam through your blog. Her laksa look awesome! I always get so jealous when I see markets like this. Oh to have one in my area. This is a beautiful post from a awesome chef! I have always loved Bobbi’s recipes and this one is no exception. Beautiful and delicious. Also, nice to meet you Jasline! I’m headed to explore more of your blog. So enjoyed all the photos of shopping in Singapore – This is indeed a wonderful curry – love all the fun toppings! Singapore is a beautiful city and so clean! You could make this curry completely vegan or vegetarian too but just need more fun tofu toppings. Thanks for stopping on over to say hello. How fun for you both to meet! I can only imagine how much you had to share and I’m guessing the conversations were going at 100 mph, lol. Fabulous, you guys! Bobbi, this dish is exquisite. Those are the best looking shrimp I’ve ever seen and every item in this dish is so fresh and perfect looking. 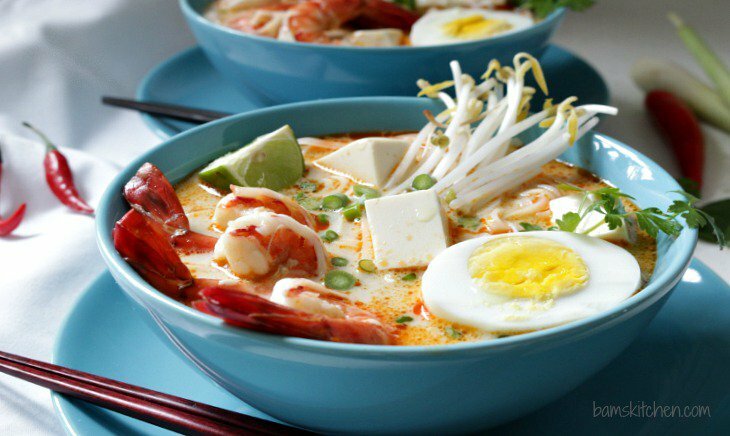 I love laksa and I love that there are so many different ways to cook it. Your photos are simply divine! Sharing all over. Of all the food I look at every single day, this is my favourite dish in the past year! Jasline is a beautiful person inside and out and yes it was like we never missed a beat. It was so nice to finally be able to give her a hug in person. I love Bam’s recipes! They’re always so pretty, and always work. This one is excellent — just a gorgeous dish. Great post — thanks. Hello John, thanks for stopping by to visit Jasline and for your very kind comments. I am delighted you like the post.